Since no user has supported your request until now, I won't fully implement the feature. - your tooltips will remain open for 15 seconds. - the workaround will work only with the next SyMenu version (v6.08). Maybe you are not using SyMenu for your portable? It's not possible because SyMenu doesn't work this way. I can't understand why your items have an absolute path BTW. And this is exactly the reason for which when a SyMenu user moves its SyMenu installation and all the programs under its control, from a folder to another or from a unit to another, he needs to do nothing to make it works. When I attach my pen drive in a new PC I don't need to care about the unit letter the PC gives to my unit. SyMenu works the same. Why do your programs have absolute paths? Topic: Symenu slow on even a 6 core 32 gb machine & ssd! Yes I'm the SyMenu developer and I strongly appreciate every suggestion coming from users. Well this project is mainly fueled by the users suggestions. Why isn't this option the default one? Because your scenario is not so common. Commonly the users do a cherry picking selection instead of grabbing all the programs at once and, if I make a precise selection, it is annoying to have folder categories automatically created from nothing. Plus the most common scenario is that a user wants to decide by himself the program categorization. I know users that spend literally years perfecting their configuration. Anyway your experience with this problem is not unique so I have to think some sort of cure. What do you think about a message that alerts the user that it is not recommended to install more than x programs (20? 30?) on the SyMenu root? Just before the installation I can easily check how many programs already are in the root folder and how many the user is trying to install, plus the currently selected option. If the option is "install them all on the root" the alert pops up and the user can choose to move on or to modify his selection. BTW if you want to help, be my guest. Please contact me in private and let's see what we can do. I want to confirm that your solution worked like a charm! Symenu is now lightning fast and enjoyable to use. The fact that it puts them in categories helps immensely with discovering all the treasure apps! I dont know if you are the developer or you can let the developer know, but I think this should be the default "out of the box" way that symenu puts the programs in... or at least make the options far clearer with simple explanations. The help documentation is great but as a busy person, I dont have much time to find the help pages and start reading about it. So if some effort is made for it to be intuitive or default option that would be great. On my side, if there is anything i can do to help you guys with the program, even if it means making a few graphics to explain the options let me know. I want to congratulate you for doing this program... i can only imagine what an immense undertaking it is to track down all these free apps and organizing them and keep the links for the downloads correct ... wow.... ! thank you all for doing this for us! The problem with your configuration is that SyMenu needs to have all the entries in memory at once. Useless and very heavy. The right way to manage tons of programs is to create some containers inside the menu and distribute the program items all along them. At that point SyMenu will be able to load only the root elements leaving the subfolders loading for a moment when you really need them. Moreover SyMenu will be able to release the unused memory and it'll become a flash. Granted! My advise is: delete everything, click the right configuration button (probably the second one: "Position the new installed programs inside some folders named according to their own category") and download them all again. You'll have a menu automatically configured with subcontainer named as the program categories. Then you can rearrange them as you like but you won't be blocked! Im sure many have made the same mistake as I. Thank you Sir.. we learn something every day. I do like this tool collection so now I am following your clear and simple instructions. I greatly appreciate your tip! 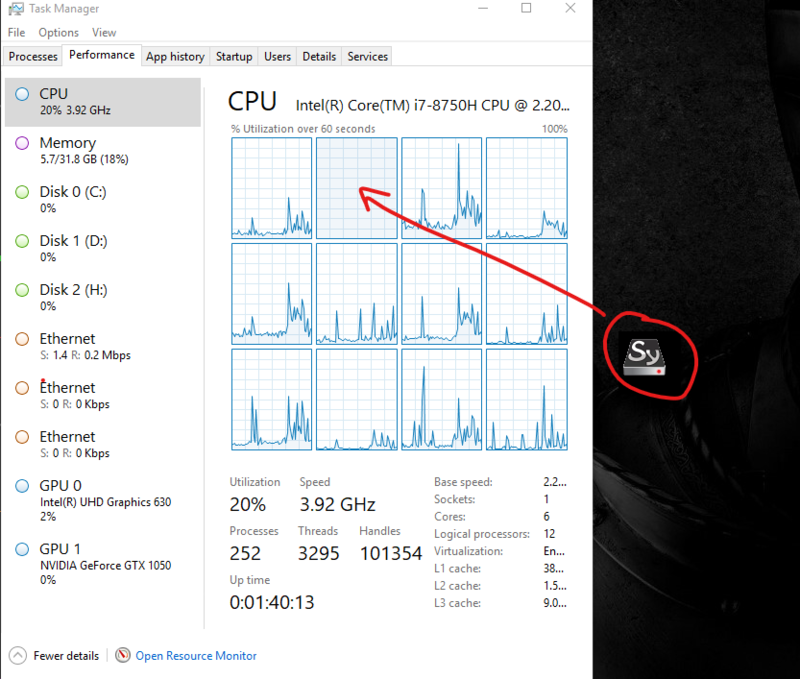 well i was thinking that on my older laptop that had i5 and 8 gb of ram... my computer was too slow to handle this program..
and there is no scrollbar. i realize that most people only select a few of the portable apps, but I WANT THEM ALL. i mean with such a powerhorse of a machine cant i have them all so i can test them? Thanks :-) I was to stupid to understand the manual. I'm embarrassed to ask the question, but where can I find the batch import? The CCleaner has the folder Icon of Audio, the Internet Folder has the LazPaint icon. The symbol path are okay. It's just a temporary display error. I only noticed one thing. If I have added many programs (via drag'n'drop), the configuration page or adding apps will be very slow. As soon as I restart Symenu, the speed is great again. Can you explain better what a wrong icon is? Is it a strikethrough icon (an icon with a red cross on it)? If this is the case, I know, thank you. It's a bug born when I introduced the red cross on icon for lost programs. Anyway when you got this situation the workaround is easy. - press Save button and Reset button. This way you force SyMenu to refresh the situation and it becomes aware of the new programs existence, so it removes the red cross. It's a simple workaround but I know that it's a bug I have to solve. Anyway it has a very low priority so I don't know when I succeed. 1) SyMenu can add apps in several ways. You can add an app dragging onto the floating icon. You can add one or more apps from the "Get new apps". They are suites' apps. You can add an app from the configuration form in several way (drag from file system, add from form menu). 2) Liberkey is not SyMenu, SyMenu is not Liberkey. If you ask a feature never tell me "I want that because it's in the other menu". I don't understand you clearly so I can only imagine what your problem is. With your first question you asked me to be able to locate an app logical position (position inside the SyMenu tree) from the context menu search bar. IMHO is a senseless request because the context menu is built to execute apps, not to manage them. On the other hand the configuration form is built to add, manage, remove apps, so it's correct that inside this form you can have a tool to locate an app logical position. And, guess what, you already have it. Enter the configuration form and press CRTL+S, start to write an app name and it'll appear while you type. Click on it and the treeview will open on that app. Now, can you explain me better what your use case is? I mean, make an example of what you are not able to do, because I don't understand where the real problem is. after I add apps to the menu (I think 20 or more) in the configuration symenu shows there wrong icons (new and old apps, foldericons,etc).Not in Sysmenu! I have to save the config, close config and shutdown symenu. After restart sysmenu I can add the next apps without problems. The location feature is in the librekey suite and I love it.